Argania spinosa (argan) is a tough little tree endemic to a limited area in southwestern Morocco and a bit of very western Algeria (Tindouf). Patchy forests of the tree cover about 800,000 hectares of the semi-arid Sous valley. These represent a unique biotope and have been designated a fancy UNESCO biosphere reserve. The presence of the forests slows desertification, as the drought-resistant trees act to stabilize the soil. Argan trees can live up to 250 years and are able to make do with poor soils that contain few nutrients. Forests of Argania spinosa provide a home for the Mediterranean fruit fly (Ceratitis capitata), a crop-eating monster that has invaded other parts of the world (see: the California crisis) and isn't too picky about what it eats (>300 fruits and veggies). 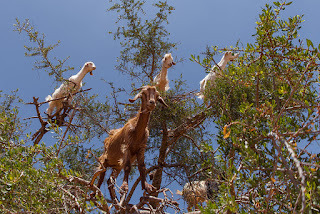 In Morocco, the flies use the forests as a base of operations from which to launch attacks on neighbouring agricultural areas, severely limiting crop production. Fortunately, research by Moroccan scientists has revealed that Ceratitis capitata is killed by certain bacteria and fungi hanging out in the soil of Argania spinosa forests. They include Bacillus thuringiensis, which makes crystal proteins that are specifically toxic to insects (Bt toxin), and entomopathogenic (insect-infecting) fungi such as Beauveria bassiana. These microorganisms are currently being investigated for use as biological control agents to control the fruit fly, which is much preferable to using nasty broad-spectrum insecticides. Ants residing near argan trees may also offer a means of controlling Ceratitis capitata, as some species prey upon fly larvae while they are looking for a place to enter the pupal stage on the ground beneath the trees. Argania spinosa has an important role in the lives of those residing near it. Much like olive trees in other parts of the Mediterranean, the argan tree provides a source of fuel (used to make charcoal), timber (hard and durable), forage for goats (which climb the trees to get at the leaves) and camels, and a highly nutritious edible oil (important source of fatty acids for locals). The tree produces a complicated, many-layered fruit. It has a thick peel, a sweet smelling but yucky tasting pulp, a hard central nut, and oil-rich kernels (usually one, but sometimes two or three) within the nut. Traditionally, the peel and pulp are removed (the pulp can be fed to animals, and its camphor-rich essential oil may make a good insect repellent), the nut is cracked to get at the kernels, and the kernels are lightly roasted, ground up (with or without water), and pressed to squeeze out an edible oil (argan oil). Due to the roasting of the kernels, the oil tastes like hazelnuts. It's eaten with bread (e.g. amlou dip = argan oil + crushed almonds + honey) or used for cooking. Argan oil is mostly made up of mono-unsaturated fatty acids, but also contains things like saturated fatty acids, polyphenols, tocopherols, sterols, saponins, and triterpene alcohols. It's somewhat similar to olive oil in its unsaturated fatty acid composition, as both contain high levels of oleic acid and linoleic acid. Since olives are grown all over the Mediterranean the fatty acid composition of olive oil can vary substantially. In contrast, argan oil has a fairly consistent composition due to the limited area in which argan trees grow. Many of the molecules present in argan oil are suspected to have protective effects against bad health stuff including cancer, diabetes, heart disease, and liver disease. The oil has also been used to treat skin diseases (e.g. acne) since ancient times. However, more clinical studies need to be done to properly assess the medicinal applications of the oil. Argan oil from unroasted kernels is included in cosmetics such as skin creams, shampoos, and hair sprays. It appears to help moisturize hair and make it shine, reduce fingernail brittleness, and hydrate dry skin while inhibiting sebum secretion (i.e. making your face less greasy) and reducing wrinkles. In particular, the high polyphenol content of the oil may protect against UV-induced wrinkle formation. The kernel residue left over after pressing out the oil (argan cake) can also be used to make cosmetics, as it contains high molecular weight proteins thought to have anti-wrinkle properties. Inhalation of the argan cake by cosmetic factory workers during its processing can cause hypersensitivity pneumonitis. This lung disease results from proteins in the cake ending up in the deepest region of the lungs, the alveoli, where they trick the immune system into causing inflammation and subsequent tissue damage. Bas P, Dahbi E, El Aich A, Morand-Fehr P, Araba A. 2005. 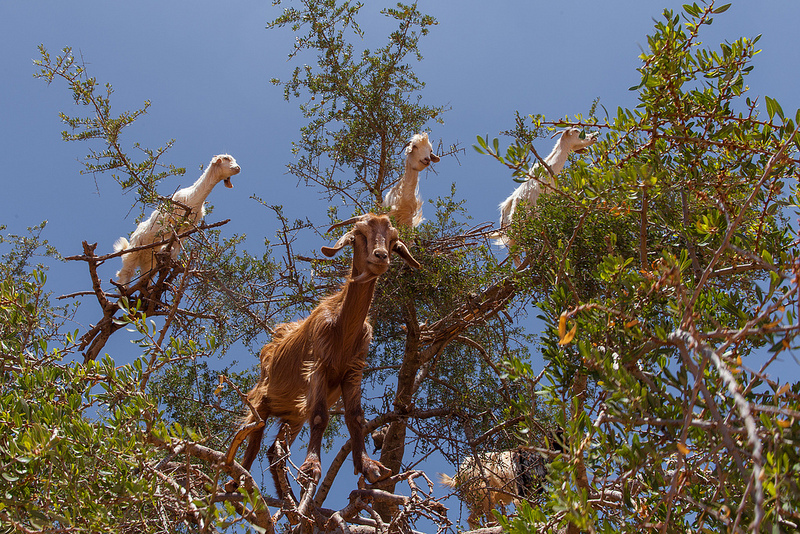 Effect of feeding on fatty acid composition of muscles and adipose tissues in young goats raised in the Argan tree forest of Morocco. Meat Science 71(2):317-326. El Mousadik A, Petit RJ. 1996. High level of genetic differentiation for allelic richness among populations of the argan tree [Argania spinosa (L.) Skeels] endemic to Morocco. Theoretical and Applied Genetics 92(7):832-839. Guillaume D, Charrouf Z. 2011. Argan oil and other argan products: Use in dermocosmetology. European Journal of Lipid Science and Technology 113(4):403-408. Harhar H, Gharby S, Ghanmi M, El Monfalouti H, Guillaume D, Charrouf Z. 2010. Composition of the essential oil of Argania spinosa (Sapotaceae) fruit pulp. Natural Product Communications 5(6):935-936. Prendergast HD, Walker CC. 1992. 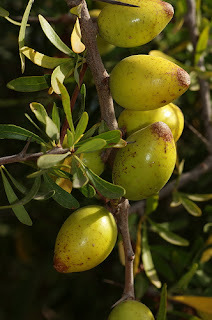 The argan: Multipurpose tree of Morocco. Curtis's Botanical Magazine 9(2):75-85.